Brightens up the front porch and the fit is perfect. Brighten up your kitchen dining spaces with this trendy set of round chair cushions from Blazing Needles. The cotton-polyester blend twill upholstery is filled with plush polyester fibers and bound together with classy tufting across the surface. These round dining chair cushions feature two fabric ties for simple attachment to any seat of your choice. Purchased the red color cushions. I was worried if the red was a true red and not more burgundy. They were true red and I am very happy with them. Stuffed just right, not to big and puffy, just right. I was happy to find these comfortable round cushions for my bistro set. Exactly the right size, and a huge variety of colors to choose from. Delivery was quick and the quality is excellent. I simply love Overstock. They give all the information on the item and if you have questions, they answer you promptly. In the picture, it looks like these are tufted with buttons. They are not. Simply stitched to look that way. The stitching where the ties are sewn is messy. Makes me wonder if they are going to split open. Fabric good, cushion material good. They look good like the bright color. Comfy. Not lumpy like some small chair cushions can be. These comfy little tufted twill round chair cushions make sitting on our wrought iron bistro chairs more appealing to our bottoms! We ordered them in a hot pink, and tied them to our bright blue outdoor bistro chairs. Awesome eye catching color combo for our outdoor patio. Very reasonably priced. Most of us have a problem with seat cushions going flat. If you can believe it this is the opposite problem. It feels strange sitting on it. The price is right but I eventually took it off the chairs. I purchased these for a bistro set with small round seats and they are perfect! I was hoping or a cushion that was actually round for our iron cafe chairs, they are not round has described in the photo. The cushions are nice and thick, and has weathered our hot summers. I ordered these cushions in the red which was a nice cherry red. The size was perfect for my bistro chairs and are comfortable with plenty of cush.Very nice ties as well. Seem like good quality & look great on my patio! I will definitely order these again if I need another color. I love the color of these cushions. They are smaller than what the information said the measurements were. They are small on my chairs but because I like the color I will keep. These chair/stool cushions are really better than expected. The softness and comfortability are excellent. I would recommend these pillows to everyone. Can't beat the price either!!! The perfect little seat cushion for my new bistro set! Thank you! The color was amazing, and they are durable. Great quality and looks great on chairs for my outdoor table. "Can these be used outdoors?" I don't think I would use mine outdoors, unless I had a covered patio. I have them inside. "Is the hot pink more of a coral pink or a fuschia pink?" Color is subjective and may appear differently based on monitor settings. In my opinion the hot pink option is more of a bubble gum pink. "Is the set pictured ruby red or just red?" Hello Tiffany1222, we try to represent the colors of our products accurately. Unfortunately, due to the difference in monitor colors we cannot guarantee that the color will match exactly what you see on your screen. Thank you for shopping with us. "Was wondering if these cushions run true to size = 16 inch by 16 inch = as i really need 15inch by 15 inch - if they run true or large Can you give me suggestions of other cushions -circle, u-shaped, square- that are 15" or 14" THANKS"
Hello brown-eyed.girlie, we can appreciate the fact you want a firsthand account of the product. You will receive an email notification every time you get a response. 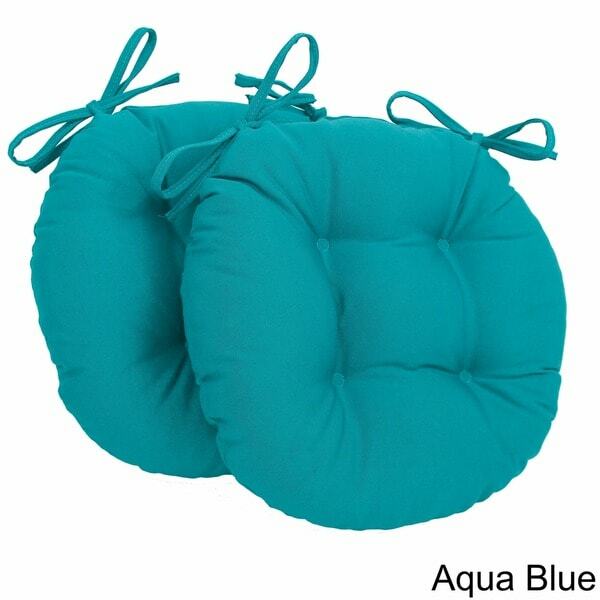 We do apologize, we are not currently in stock with more options for a 14 - 15 inch seat cushion.However, I did locate two outdoor cushions you may like to see as well, Item 15246107 and Item 15700534. Thank you for shopping with us.